Water features within the landscape are known to add to the serenity of the setting. The sound of water flowing in a trickle or steady cascade can be soothing. Features may include fountains, water pots with recirculating water, or ponds with waterfalls and even streams. Such features are highly desired and are becoming more common in new landscapes. Drawbacks to water features include maintenance of water quality, debris removal, service to and replacement of pump equipment and filter media, and higher installation cost and costs of operation in electricity and water expense. One alternative to the standard water feature is the “waterless pond”. Such features maintain some water movement creating the sound of flow, while limiting the maintenance and cost issues of a standard water feature. A feature that goes a step beyond the “waterless pond” is the dry stream bed. The dry stream gives the suggestion of water without the added costs in installation and maintenance. It is not easily limited in the area that it occupies in that it can readily be expanded to fit a designated area. Costs typically limit the size of most water features, but the dry stream bed is not so affected. 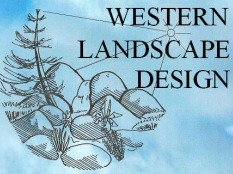 Plant selection and density of planting around the dry stream bed create a variety of effects ranging from a mountain stream or a tropical hideaway to a desert wash – depending upon stone and material selected.